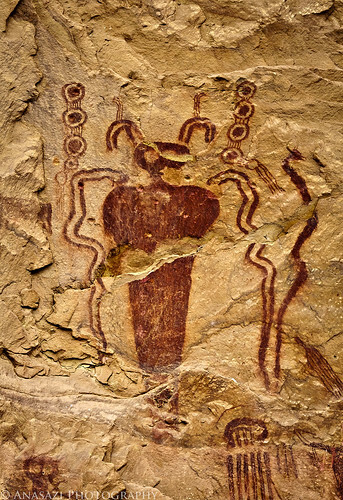 Sego Canyon in the Book Cliffs contains three culturally distinct styles of rock art that are all in close proximity to each other: Fremont, Ute and Barrier Canyon Style. This site is well known and an easy side trip when you are travelling along I-70. Unfortunately, with easy access come vandalism and these panels are no exception to that rule. Thankfully, the main panels located here have been restored as best as could be done. However, some of the other panels in the vicinity have some severe damage. The above photo is just a small portion of the very large Barrier Canyon Style pictograph panel located here. This is one of the more unique anthropomorphs located here and is surrounded by snakes on each side and many interesting circle figures. I know I’ll eventually be posting a wider view of this panel sometime in the future so you can see the full thing. Since this site is not too far from home, and I’m usually driving past it almost every weekend, I end up stopping there at least a few times throughout the year…..it never gets old.